BBC- Sir Mo Farah has said it "breaks his heart" to hear how families are facing starvation in East Africa as he backed a UK charity fundraising appeal. The Olympian said it "hurts to see children without food and water" and urged people to "act now". He said: "As a father of four, it hurts to see children without food and water, but this is a reality being faced by parents in East Africa right now. "The drought is really bad and there are millions of children at risk of starvation. "I was born in Somalia and it breaks my heart to hear stories of how families are suffering." In Kenya, the country's president Uhuru Kenyatta declared its drought a national disaster and Kenya's Red Cross says 2.7 million people face starvation. Saleh Saeed, chief executive of the DEC, said hunger was "looming" across East Africa. He said more than 800,000 children aged under five "are now facing starvation and will die soon if we don't reach them and act quickly". "We are hearing that families are so desperate for food that they are resorting to eating leaves to survive. This is something no family should have to endure," he added. "Unless we act now the number of deaths will drastically increase." Mr Saeed told BBC Radio 4's Today programme the money raised is being used to provide water, sanitation and food. "We're providing, to children who are severely malnourished, Plumpy'nut paste which is a miracle cure which really brings back children from the brink of death." He said that, while it was important to talk about the long-term infrastructure of countries like Kenya, the areas impacted by the crisis were facing an "emergency situation". Addressing concerns that some of the money going to the countries affected by civil war may be stolen by the government or rebel forces, he said the charities brought together by the DEC work directly with staff and vetted organisations on the ground. 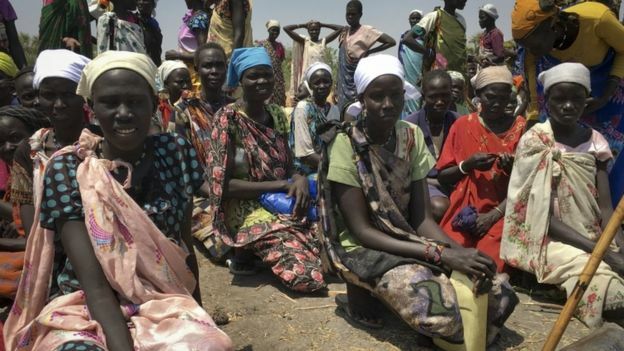 Mr Saeed said it was "unfortunate" that the government of South Sudan was reportedly considering charging aid workers to enter the country. He added: "We need to put it into perspective. The amount of money that is lost on fraud is actually quite small. The reality is the bulk of the money that is donated actually reaches people in need. "So any incidence of loss or theft is no excuse and no reason [not] to help the millions of people starving." International Development Secretary Priti Patel said UK aid has funded food, water and emergency healthcare in East Africa, but more support was "urgently needed to prevent a catastrophe". She said the international community must follow the UK's lead "to save lives and stop the famine before it becomes a stain on our collective conscience". "The world cannot afford to wait," she said.